Here's what you need to bring with you on your charter fishing trip. These include non-marking shoes with soft soles, a hat, sunglasses, suntan lotion, rain gear, and a large cooler for the day's catch. You should begin taking motion sickness medication 24 hours before the trip. You will also need to get a New York state fishing license, which you can buy when you reach town. 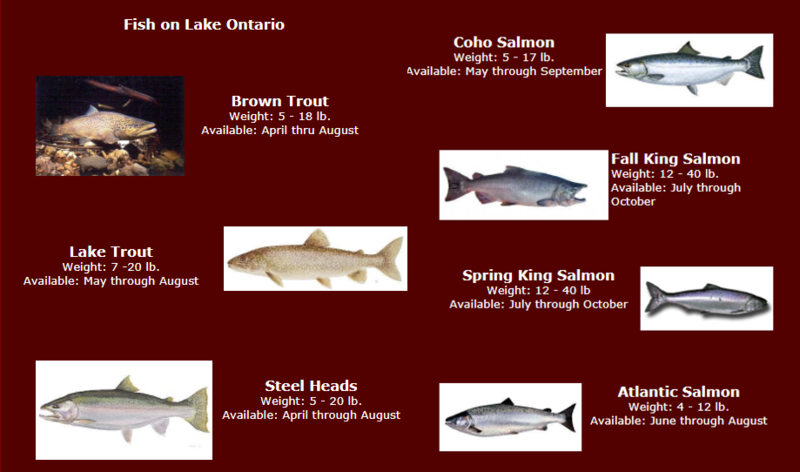 You will be fishing on the New York side of Lake Ontario and it does not require a passport. The 2019 fishing season is upon us and I want to say thanks for your support in past seasons. I am looking forward to a repeat of last year’s fishing season. The 2018 season was hands down the most dynamic fishing Lake Ontario has had in over twenty years. It was also one of the windiest years we’ve experienced lately. We had a very late start due to heavy winds that delayed our season by three weeks. Once we did get started it was steady Brown Trout action along the shorelines. Our first sign that this was going to be a tremendous year came quickly when we started catching Kings in April in 6-10 feet of water consistently. To those of you had the awesome experience of catching a 12-20-pound King on 10 lb. test line congratulations. To those of you reading this and saying wow let me remind you April & May are quickly approaching. 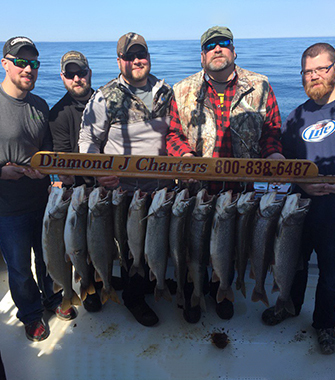 June arrived and we were enjoying limit catches of multiple species and it appeared there was no end to it. I had numerous conversation on the docks with many fishermen’s and the theme was the same (The Kings Are Everywhere) they were in shallow water, mid-range and offshore. We all kept waiting for the dream season to end and it never did. I moved the boat to The River for the fall run and they just kept coming, in many cases we had to go offshore for them but we were rewarded for our efforts every time. The 2018 Fishing season was a great success; the fish gave us many great memories and destroyed a lot of tackle. I would like to thank everyone for your support. Please take a moment and visit the website, it has gotten another tune up and offers more than ever to see. This year I took many videos of fishing trips and received videos taken by some of you, they all have been loaded up for your viewing pleasure. It is my plan to take and upload videos throughout the 2019 season. The website offers a great deal of information to make your trip easier to plan. The 2016, 17&18 pictures of your fishing trips have been loaded up as well; just click on the tweet button and enjoy. I am looking forward to seeing many of you at the outdoor/sportsman shows coming up soon.